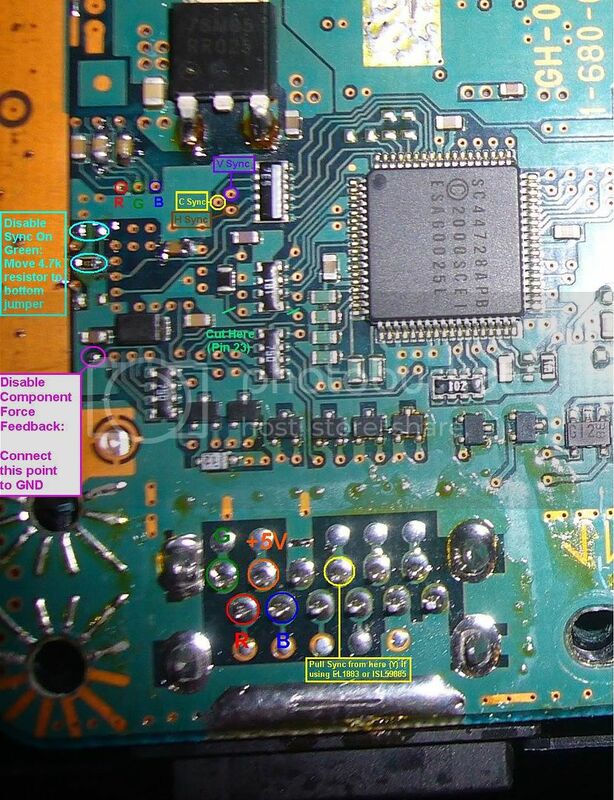 The Super Detailed F**k Macrovision PS2 Hack! First, I want to thank RARusk for his awesome page that made this mod possible (see it here:http://www.gamesx.com/wiki/doku.php?id=av:playstation_2_rgb_sync] [url]http://www.gamesx.com/wiki/doku.php?id=av:playstation_2_rgb_sync[/url]). And to Oliviera's work over here: http://psx-scene.com/forums/f20/ps2-vga-hack-kiss-sync-green-goodbye-%3B-42592/. The main purpose of this mod is to disable ALL protections & Macrovision/Component/Sync On Green Bullsh*t that makes standard RGB output impossible on a PS2 (playing DVDs at least). This great thing about the PS2 is that it is one of the only DVD players on the US market with RGB output possible. If you have a PVM or other RGB monitor this is an ideal setup for those of us that prefer standard res instead of hidef (and hiprice) BluRay stuff. RARusk's guide is great but unfortunately did not cover my model of PS2. It's a SCPH-3000 like his, but mine is the newer revision. Using the Service Manual (available here: http://www.eserviceinfo.com/downloadsm/27755/Sony%20Computer%20Entertainment_Play%20Station%202.html), I retraced RARusk's work and found all the necessary points for the mod. I found some interesting new things. One, is that you can use a ISL59885 (or EL1883) to pull the sync from the Y line and use the RGB outputs on the connector once these mods are done. I found this much easier that building sync buffers and combining H and V sync. This method is also much safer since you aren't messing with the Sync lines directly. Oddly, pulling C sync directly from the chip produced a scrolling image once the DVD started (even running through a ISL59885). Pulling it from the Y output did not cause this problem. The green border at the top of the screen was removed when connecting the Force Component Feedback pin to ground (highlighted in pink). You can also try leaving the 1uf cap in place on the top board. I believe you can get it working without removing this. And getting there is a PAIN, since you have to desolder a giant 4 pin connector to remove the PSU board. I found this pretty dangerous and really wished I used a hot air gun to do it more safely. I also found it safer to use +5v from the AV pinout. That way if anything goes wrong you don't fry the entire video board. I highlighted the RGB points running directly to the Video Decoder (through .1uf caps) in case someone wants to use them instead of the AV points (though I don't recommend it). ...and don't forget to terminate the Y line with a 75 ohm resistor.